New to the market! 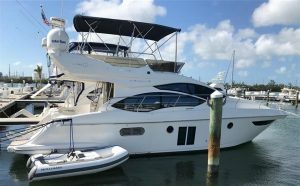 40' Azimut 2013 located in Key West! : Atlantic Yacht & Ship, Inc.
New to the market, a 40′ Azimut 2013 located in Key West. Upon entering the salon from the cockpit, there is a large leather sofa which converts to a sofa bed and a hi-lo dining table. To port is the entertainment center with TV and storage. The galley is equipped with refrigerator/freezer, microwave, stove, sink and storage. There are Hunter Douglas custom shades throughout the vessel along with solar tinting windows. Forward is the cabin area and guest stateroom. It features two lower berths, closet, drawers and TV. It also has private access to the guest head. The guest head is forward with shower, toilet, sink and storage. Forward is the master stateroom with center line queen bed, Samsung TV, closet, storage and en-suite head. This 40′ Azimut 2013 has a Opacmare hydraulic swim platform with ladder. Located at the bow are large foredeck sun pads for relaxing and sunbathing. The flybridge is protected by a canvas Bimini top. For more information on this 40′ Azimut 2013, contact Bryan Miller at Atlantic Yacht & Ship, Inc. today.